This week is Tartan Week, with Tartan Day on Wednesday, April 6 and the New York Tartan Day Parade on Saturday, April 9th. 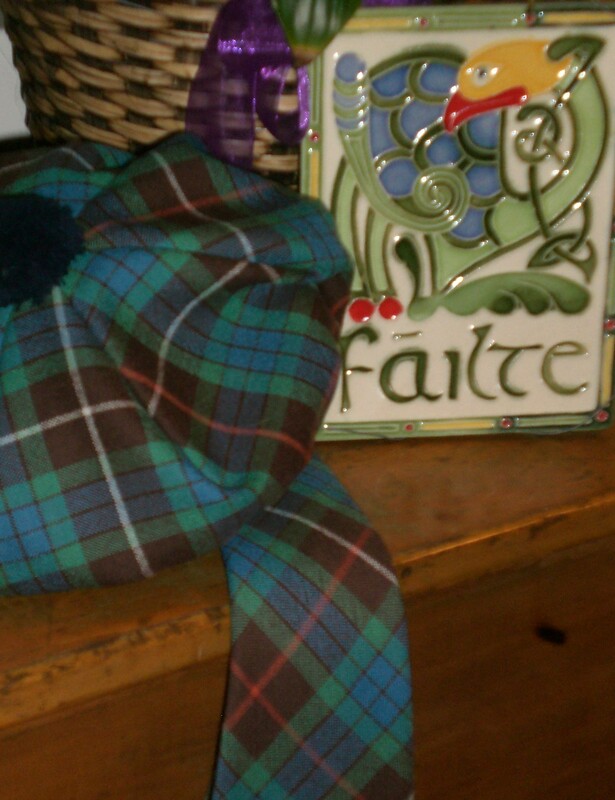 In honor of that, here is a re-post about Tartan Day originally from April 3, 2104. In 1982, Scottish Americans gathered in New York City to celebrate Scottish-American heritage and the contributions that Scots have made to American culture and history. The gathering was organized by the New York Caledonian Club and was declared by both the Governor of New York State and the Mayor of New York City to be Tartan Day. The event was held on July 1st, the 200th anniversary of the repeal of the Act of Proscription which forbade the wearing of the tartan in Scotland. In 1986, the Federation of Scottish Clans in Nova Scotia proposed a ‘Tartan Day’ to promote Scottish heritage in Canada. The Federation petitioned provincial legislatures to recognize April 6 as Tartan Day. Nova Scotia was the first province to make the proclamation in April, 1987. Quebec was the last to do so in 2003. April 6th was chosen for the date in honor of the April 6th signing of the Declaration of Arbroath in 1320. A letter written to Pope John XXII, the Declaration of Arbroath intended to confirm Scotland’s independence and was signed by thirty-nine ranking Scottish landowners. It asserted Scotland’s sovereignty over English territorial claims and a declaration of Scottish independence against Edward I’s English rule. The grassroots effort for a National Tartan Day in the US, led by the Caledonian Foundation, began in 1995, and on April 6, 1997 the first National Tartan Day was celebrated in the United States by a Senate Resolution for a one-time celebration. In 1998, Tartan Day was officially recognized on a permanent basis when the U.S. Senate passed Senate Resolution 155 recognizing April 6th as National Tartan Day. This was followed by companion bill, House Resolution 41, passed by the U.S. House of Representatives on March 9, 2005. Four years later, the National Capital Tartan Day Committee and the American-Scottish Foundation jointly promoted a campaign for a Presidential Proclamation for Tartan Day. On April 4, 2008, President George W. Bush signed a Presidential Proclamation making April 6 National Tartan Day. 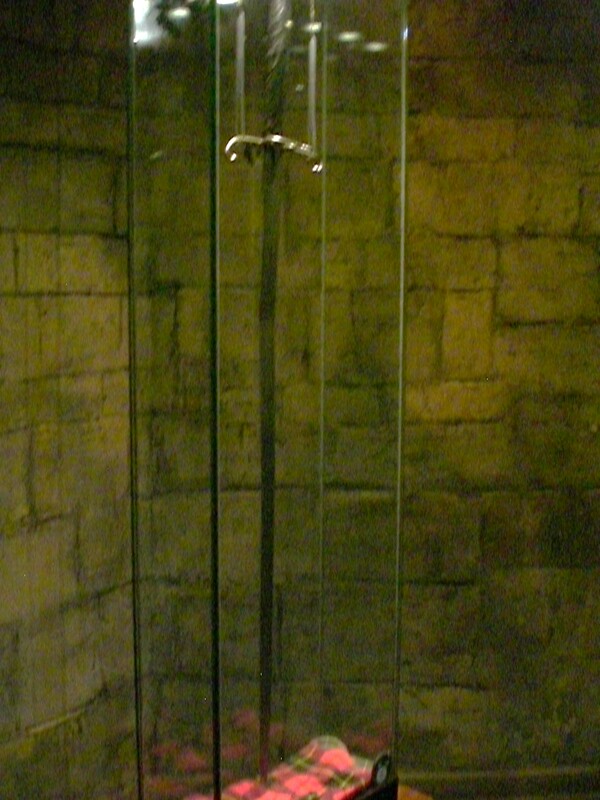 In 2005, the sword of William Wallace was taken down from the Wallace Monument and left Scotland for the first time in its 700-year history to be taken to New York City as part of the Tartan Day celebrations. Kyle and I had been debating about trying to climb the 71 stairs of the Wallace Monument to see the sword when we were there in late March of 2005. Considering his injured ankle, we decided against it. We were very happy with our decision when, in the next day’s paper, we read that the sword had been removed the day we were in Stirling. We did get to see it last year, though! Tartan Day has now taken on global importance, and celebrations are held by those of us of Scottish descent as we attend large celebrations such as those in NYC and other major metropolitan areas or smaller Scottish & Celtic Fairs in our own areas. At the very least, there is the wearing of the tartan. So if you see someone wearing a plaid this weekend, it’s quite possibly much more than a fashion statement! Earl of Carrick, Robert Bruce was born at Turnberry Castle, Ayrshire, on July 11, 1274. He was born into an aristocratic Scottish family with both Norman and Celtic ancestry. His grandfather had been one of the claimants to the Scottish throne during the dispute of succession from 1290-92. During that time, Edward I of England had been asked to settle the dispute; he chose the weaker, more likely to do Edward’s bidding, John Balliol to be the king. Neither Bruce nor his father would stand behind Balliol, and were both supporters of the campaign of Edward I when he invaded Scotland in 1296, forcing the abdication of Balliol. Afterward, Scotland was ruled by Edward I as a province of England. Bruce supported the uprising led by William Wallace against the English, but even after Wallace had been defeated, the Bruce lands were not confiscated. In fact, in 1298, it was Bruce who was named as guardian of Scotland along with Balliol’s nephew, John Comyn. The two men were rivals and quarreled often. In 1306 they had a great quarrel while meeting in Greyfriar’s Kirk at Dumfires, during which, Bruce stabbed Comyn and killed him. Bruce was excommunicated by the pope and outlawed by Edward I. This did not deter him from proclaiming himself King of Scotland. Historically, Scottish Kings were crowned while sitting upon the Stone of Destiny at the mound at Scone, but since Edward I had stolen the stone in 1296 at taken it back to London, Bruce was not able to sit upon it for his coronation. The coronation ceremony should have been conducted by the Earl of Fife, but the Earl was in prison. The Earl’s daughter, Isabella, rode to Scone to represent her father, but Bruce had already been crowned by the time she arrived. The ceremony was repeated in her presence to assure that the representation of the Earl of Fife was recorded. Later, it was judged that both of the ceremonies had been legal ones, and so Robert the Bruce was crowned the Scottish king, twice in one day, March 27, 1306. The next year, Bruce was deposed by Edward I’s army at the battle of Methven and he fled to an island off the coast of Northern Ireland. His wife and his daughters were thrown in to prison and three of his brothers were executed in his absence. It was while he was hiding on the island that the legend of Robert Bruce and the spider was born. Alone and seemingly defeated, he was ready to give up, but he noticed a spider weaving a web in the cave where he was living. He saw how the spider struggled to catch places in the rocks to put its web, and how it kept trying over and over. As the spider was finally successful, Bruce found the inspiration to return to continue his fight for a free Scotland. He returned to Scotland a year later, and with Sir James Douglas, “the Black Douglas” at his side, he fought his first victorious battle of the new campaign on Palm Sunday, 1307. The Clans from all over Scotland came to Bruce’s aide, and their combined strength won many battles against the English. By 1314, he was fighting against a much larger army led by the newly-crowned Edward II of England. Bruce won a decisive battle at Bannockburn in June of 1314, and the independent Scottish monarchy was re-established. The Scottish army captured Berwick in 1318, and still Edward II refused to relinquish his claim to the Scotland. In 1320, the Scottish “community of the realm” sent a letter to Pope John XXII in which they asserted the “antiquity of the Scottish people and their monarchy” declared that Robert the Bruce was their rightful king. Four years later, the Pope gave formal recognition of Robert the Bruce as king of an independent Scotland. The English deposed Edward II in 1327; his son was placed upon the throne and formalized peace with Scotland, renouncing all English claims over the country. Robert the Bruce died on June 7, 1329. He was buried a Dunfermline, but as per his request, his heart was to be taken to the Holy Land. His heart never made it as far as the Holy Land, and was returned to Scotland from Spain and buried in Melrose Abbey. Scotland remained independent until King James VI of Scotland also became King James I of England and Ireland, and formed the union of the Scottish and English crowns on March 24, 1603. Elgin Cathedral (pronounced with a hard “g”) sits on North College Street in the town of Elgin (Scots, Ailgin; Gàidhlig, Eiginn) near the River Lossie in Moray. It was originally built for the bishops of Moray (promounced “Muh-ree”, Moireibh in Gàidhlig) and was known as the “Lantern of the North” because it stood as the dominate structure over the fertile but flat landscape of Moray known in Scots as Laich O’Moray, laich meaning low-lying land. (l) The west front, flanked by two tall towers which were part of the original building, and the center processional entrance, dating from after 1270. (r) Much of the nave is reduced to foundations, but the rest still stands remarkably complete. It took us about a half an hour to drive to the east of Nairn on the A96, and we were soon wandering the grounds of the magnificent ruins. The Cathedral was originally built in 1224 and was expanded after a fire and a couple of armed attacks over the following two centuries. After the Reformation, the roof caved in, and the central tower collapsed in 1711. In the early 1800’s, the appointed keeper of the property, one John Shanks who was described as a “drouthy (thirsty) cobbler”, began to give tours around the property to those who were interested. Thus began Elgin Cathedral’s life as a tourist attraction. (l) The stone bishop, looking like a giant chess piece, once stood in the crossing tower. (c) From the top of the tower. (r) The octagonal chapter house dates from the late 1200s. Pictish cross slab in the middle of the found on the site of St Giles Parish Church, where the town hall now stands, and the opposite side which depicts a hunting scene. Before we left the town of Elgin, we made a stop in the center of town at the shop of Gordon & MacPhail, which has become a definite on the list of places to go. It is a wonderful place to find local cheeses and snacks for the car, and it has the most amazing collection of whiskies I have ever seen outside of the Whisky Experience in Edinburgh. Other than stocking up on edibles, my task was to step in to the non-whisky area and procure a bottle of Gilt Gin for Liisa. This particular gin is made in the same way as whisky, distilled five times from malted barley. I’m not a gin drinker myself, but I knew that she’d gotten a bottle of it when we were all in Scotland together in 2013 and that she really liked it. Aberdeenshire, named for what was originally the County of Aberdeen, now includes parts of what were formerly Banfshire and all of the former Kincardinshire. Re-districting took place under the Local Government Act (Scotland) of 1994, making Aberdeenshire one of thiry-two Council Areas of Scotland. More commonly than Scots Gaelic (Gàidhlig), the Mid-Northern dialect of Scots called Doric is spoken in Aberdeenshire, where the rest of us are inabootcomers, and after being greeted with “aye-aye min” (“Hello”) may be asked “far div ye bide?” (“Where are you from?”). Apologies for bothering someone for directions or a request at a shop or tea room is met with “dinna fash yourself” (“don’t worry”). And, of course, one does not want to “droon the miller” (put too much water in one’s whisky). The northeastern part of Scotland, especially the area of Aberdeenshire, is recognized as the origin of what Sir Walter Scott named “Border Ballads” referring to the Lowland area near the border with England. In fact, researchers have shown that of the 305 Child’s Ballads, 91 of them came from Aberdeenshire. Aberdeenshire is also the homeland of my ancestors and I love to wander through the countryside. When Kyle and I traveled to Scotland in 2005, we spent most of our time in Aberdeenshire looking for places named on the family tree which are tucked in the far northeast corner of the country within the triangle formed by Banff, Peterhead and Fraserburgh. Having gotten ourselves well stocked with munchibles, we drove south from Elgin on the A941 as far as Rhynie, where we started winding our way along smaller unmarked roads eastward to the area north of Inverurie which has quite a few stone circles and solitary standing stones. Our main objective was to spend time at the recumbent stone circle, Easter Aquhorthies. We turned on to the single lane road that leads up a long sloping hill to the car park, and then walked for five minutes or so up another sloping hill lined with gorse bushes. The shorter lane off to the right that leads to the site was lined with tall purple wildflowers that were just starting to send their soft white cottony seeds to the winds. The circle itself is protected behind a fence with an easy-entrance gate. The circle sits upon a low bank built up with a dry stone wall, which was added at some date later than the origin of the circle around 3000 BCE. Easter Aquhorthies may come from the Gàidhlig meaning “field of prayer” and it seems feasible since the recumbent stone (the large stone, lying on its side between the two upright stones) looks every bit like an altar. The stones of this circle are of different types: the circle is made of porphyry and have a soft pinkish color; the stones that flank the recumbent stone are grey granite; the upright stone on the east side flanking stone is red jasper; and, the recumbent stone itself is red granite, which was transported from Bennachie nearly six miles to the west. Five miles north of Easter Aquhorthies is the village of Chapel of Garioch (pronounced “Gee-ree”), three miles or so northwest of the town of Inverurie. I had planned for us to have lunch at the Old Post Office Tea Room and we were not disappointed at the choice. It’s a very quaintly decorated little place located at the crossroads of two unmarked roads to the west of the A96. The building has been “sympathetically renovated” and much of the original building is intact, including the shelving along the walls. The tea room serves freshly-made light lunches and baked goods. We had some delicious soup and cheese toasties (grilled cheese). The young woman who was our server gave me a very nice compliment on my American accent “different from others (she’s) heard”. As sweet as the compliment was, it did not deter us from having dessert. Staying on the unmarked roads, we continued to wind our way to the southeast toward Stonehaven. Just to the north of Stonehaven is the little fishing village of Cowie, the sign for which I can be seen smiling from in the banner photo above. Aside from being the place of the beginnings of the Cowie name as a sept of the Fraser clan, Cowie is the eastern end of the Highland Boundary Fault. Running across the country, the Highland Boundary Fault begins in Arran, runs up the Firth of Clyde, and then crosses the mainland from Helenburgh on the west coast, through Loch Lomond and then eastward to Cowie on the east coast. It separates the topography that differentiates the Highlands from the Lowlands. The exact point at which the Fault ends is at the ruins of what is known as Cowie Chapel, alternatively called the Chapel of St. Mary and St. Nathalan. The ruin of the Chapel that was founded around 650 CE by St. Nathalan sits on the bluff above the North Sea and was on the only route between Stonehaven and Aberdeen for centuries. South of Stonehaven is Dunnottar Castle. We reached the castle at a time when a lot of other people were leaving, and I smiled at my consistent luck at being there four times, all of them without any crowds. Our accommodations for the night were at Croftsmuir Steading, just to the south west of Arbroath. Kyle, Liisa and I had arrived there in the dark in 2013, and I wanted to avoid the wandering around on unmarked roads again, so we set off to make the hour-long drive form Dunnottar in plenty of time to get there before sunset. When the three of us had been there, we were all completely taken with Gordon and Anne who own Croftsmuir Steading. Staying there is truly like going to visit one’s favorite auntie and uncle; they are warm and welcoming, and more that that they are fun to talk with. We had time to stop and see Arbroath Abbey although it was closed by the time we got there. Getting to Arbroath in the daylight hours did not prevent me from getting turned around while driving through the countryside, and spending a bit of time wondering where I was in relation to the Steading. I would come to discover that my dyslexia had gotten the better of me and I had reversed numbers when I put the postal code in the GPS. I gave up after a couple of tries at it and called Gordon. He, in his completely wonderful way, asked me to describe what was around me, told me he knew where I was, and drove out to get us. When we drove into Arbroath for dinner, he put the code in my GPS for me so I could find my way back. The ruins of Urquhart Castle roll along the hillside above Loch Ness, each remaining stone a testament to the history of Scotland. It’s one of my favorite places to visit and each of the four times that I have been there, I have seen it in a different light, figuratively and literally. The first time I was there, it was shrouded in fog, a year later it was not raining, but was overcast, dark and gloomy. A few years later the weather was bright and sunny when we were there, and this past year it was raining. Each time, the way the light played upon the stone walls gave me a different sense of the place. And the waters of Loch Ness mirrored the mood. I’ll let the photos from over the years speak for themselves. To read what I have previously written about the history of Urquhart Castle, click here. We drove north on the A82 toward Inverness. Tomnahurich Hill was much easier to find this time because we were approaching from the south, and I knew what I was looking for. Two years previously, Kyle and Liisa and I had circled around a bit to find it as we drove in from The Black Isle north of Inverness. I have previously written about the history of Tomnahurich Hill here. It was my talking about my being there with Liisa and Kyle that sparked Marsha’s interest, so when I planned the trip for her, I made certain to include it. We were there for quite a while, silently walking our separate ways through the trees and the headstones. As I had before, I kept to the trees around the perimeter and spent a lot of time near the yew tree that stands as a sentinel in the center of the top of the hill. Just a short drive to the southeast of Inverness is another of my most favorite places in Scotland, the Balnuaran of Clava, or Clava Cairns which have given their name to this certain type of cairn. Clava Cairns is another of the places that is a “must” for me. A couple of years ago, I wrote a review for Clava Cairns on social media. While I praised it for its beauty and serenity, I also mentioned the times that I have seen people climbing on the cairns, and generally dis-respecting the antiquity of the site. This time, I was very happy to see a sign at the entrance gate asking visitors to enjoy it with their feet on the ground. And, no, it is not where a certain fictional character “went through the stones”. There is no need to touch them to find out. It doesn’t mean there may not be some energy around the cairns, though. To read about a very interesting experience that I had there, click here. A twenty-five minute drive to the northeast from Clava Cairns, about half way to Nairn, is the village of Cawdor. The spelling was changed from Calder in the early 1800’s by the resident Lord so that it would match Shakespeare’s Macbeth, who was the Thane of Cawdor. Cawdor is now a designated conservation area of Scotland and includes Cawdor Castle. Located in what was originally the workshop for the castle is Cawdor Tavern, one of my favorite places to have a good meal. They prepare specialties daily from locally-harvested, in-season sources. My friend Sheelagh met us for dinner there before we drove over to her B&B in Nairn for the night. I’ve stayed at Greenlawns three times and Sheelagh has always been the greatest host. It’s evident that she loves what she’s doing there. Since there were no other guests, she allowed us to spread out in the drawing room and go through all our clothes. We had to get things settled for the trip home, and since we had a few days worth of clothes extra that we’d bought before we were re-connected with our luggage, not to mention assorted treasures purchased along the way, we had to decide how to handle it all. Sheelagh took the extra clothing and donated it to the refugees that were, at that time, just beginning to arrive in the UK from the Middle East. We talked, drank wine and accepted that fact that we weren’t going to fit in to the one suitcase each that we’d started out with. After a good night’s sleep and a wonderful breakfast, we were off again to travel the countryside of Aberdeenshire. The Waternish is the pennisula in the west and is home to Dunvegan Castle and the Faerie Flag of Clan MacLeod. As much as we wanted to see the flag, the CalMac Ferry docked at Uig at 5:40 PM (An Ùig, from the Norse vik, “the sheltered bay”), giving us just a few minutes more than two hours until sunset. In light of this, we had elected to drive north out of Uig on the A855, and continue along the eastern coast of the Trotternish (Tròndairnis) peninsula and head south in to Portree where we had reservations for the night. This gave us the opportunity to see some charming little hamlets tucked in the hills, the rock formations of the Quiraing and the Trotternish ridge, Kilt Rock and the Mealt Waterfall, and The Storr with its landmark, The Old Man of Storr. This northern part of Skye was formed by successive lava flows which built up to 2000 feet on top of the sandstone base of the island. This put pressure on the underlying rocks and in time everything went tipping over on its side, exposing the layers of rock in a vertical. Over time the lava rocks were eroded by the wind, water and weather and now the landscape is full of interesting rock formations. From the A855, the turnoff for the Quiraing is clearly marked. In Gàidhlig it is called Cuith-Raing which came from the Old Norse, Kvi Rand “round fold” referring to the landform that was once used to hide cattle from raiding Vikings. Had we had the daylight left for the hike it would have taken us on a two-hour walk up in to the terrain of the landslip. This area is the only part of the island that is still experiences some geological movement; we saw signs indicating that the road from Flodigarry south was liable to give way. As we drove along, some of the rock pinnacles and formations were visible high above us in the hills. We passed the small village of Staffin (Stafain). 61% of the Trotternish population is Gaelic-speaking and refer to the area as An Taobh Sear “the East Side”. Dinosaur footprints can be seen along the shore near Staffin and more fossils are housed at the Dinosaur Museum. Just south of Staffin is Kilt Rock and the Mealt Waterfall. The car park near the crofting village of Ellishadder (Ealaiseadar, “dwelling of the stone, or of the rock”) allows for some great viewing of the nearly 300 foot sea cliff of vertical columns of basalt on top of sandstone that make a kilt-like pattern in the cliff face. The waterfall is fed from the freshwater Loch Mealt located just to the west of the road and crashes to the rocky edge of the sea. As we stood there enjoying the beautiful view we became aware of a soft humming around us. A selkie crying in the wind perhaps? Or the wind playing across the open pipes of the safety fence like the top of a soda bottle? I wish it had been the former. Further south and overlooking the Sound of Raasay (Ratharsair) is the part of the Trotternish called the Storr (Gàidhlig, An Stòr, from the Old Norse, stórr,”big”). The western slope of the Storr is a grassy slope, but the eastern side is a huge rocky outcropping that rises up out of what is called the Sanctuary and stands as the highest point on the peninsula. The Old Man of Storr is a rock pinnacle that sits a bit away from the outcropping and is one of the most photographed places in Scotland, if not the world. As darkness began to set in, we reached the town of Portree. Now called Port Rìgh in Gàidhlig, meaning “the king’s port”, there is an older name, Port Ruighe(adh), meaning “slope harbor”. I was looking forward to visiting with our hosts for the night; when I booked the B&B, the owner and I had had conversations about my being able to try out the Gàidhlig I had so diligently been studying. Nearly 40% of the population of Portree can speak Scots Gaelic and our hosts were no exception. Unfortunately, we had barely any conversation at all, much less in the Gàidhlig. To make matters more disappointing, the request I had made for a fragrance-free room went ignored. Even the toilet paper had been scented. The accommodations’ lack was more than made up for by the dinner we had in the town. At the B&B we had been told that because we had arrived so late in the day, all the restaurants would be full. We were pointed in the direction of a pub, but when we got to the car park we noticed what looked like a nice restaurant directly across the street. We decided to give it a try and we were more than not disappointed, we were thrilled. The Granary is located in Somerled Square in the Town Centre of Portree. As we approached, we saw that the restaurant was absolutely packed and were bracing ourselves to be turned away. We were greeted by Craig, who gave us a table right away and then handed our care over to our server, Charlotte. They bill themselves as a café, but the atmosphere was relaxed and still upscale enough to make it more a restaurant. The food was the best that we had on the entire trip, and we had great food everywhere. Our shared appetizer was the Ginger Poached Pear with Goats Cheese, Candied Pecans, Citrus and Thyme Syrup over Dressed Salad Leaves. (My mouth is watering at the memory of it as I write this.) For an entrée Marsha ordered the Lentil Soup and Peat Smoked Mallaig Salmon, Sweet Onion Puree with Homemade Tartar sauce and Granary Bread. She said that the salmon had a delightful taste of peat without being overbearing and that it was the best thing she had ever put in her mouth. I was blown away by the Chestnut, Baby Artichoke and Goats Cheese Stack Drizzled with Red Pepper Coulis, served with Honey Roasted Fig Finished with Hazelnut Praline. Thusly blissed-out by the food, we took a short walk through the town before we headed back to the B&B.